A new week, reader. Hello again. Uncertainty plagues all meaningful pursuits; if we are to do our best work in the face of uncertainty, perhaps we must first hone perspectives that allow us to stay the creative path. So in these notes I reflect on various themes. This week, imitation. This image has been stuck in my head for quite a long time, from the LIFE Magazine archives here. A reminder of how natural it is for us to mimic those around us, from an incredibly early age. Later in life, we instinctively think of mimicry as an unfavorable thing—the opposite of creativity, derivative. 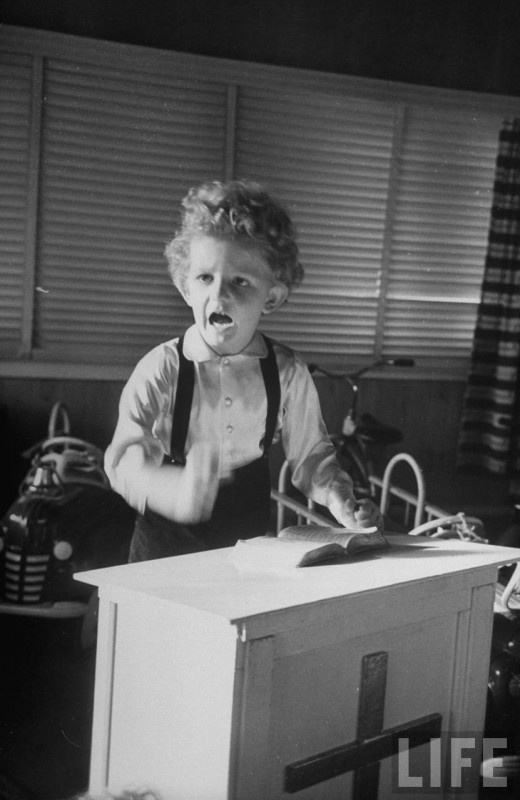 Images like this one can be found everywhere, ranging from dozens of articles from local publications heralding their own miraculous four-year-old preacher today, to scores of YouTube featuring babies dancing remarkably well to all genres of music. So it's worth considering wonder whether mimicry is in fact the most basic unit of human interaction, perhaps the most real way to be human indeed. For me, this idea was later confirmed by the production Everything Is A Remix, the work of filmmaker Kirby Ferguson. In four short and entertaining films covering entire histories of media and entertainment, a convincing and well-researched case for imitation as not the antithesis of creativity, but in fact the very beating heart of it. In one of the strangest tricks life has to offer, our behavior, actions and even thoughts are less the result of some tiny "us" sitting in a command chair just behind our eyeballs, and much more the result of what we mimic from people around us. I've now found that the best way to do great work is to surround oneself with a world one can't help but imitate. Perhaps for me that world is best defined by the BERG community, a now disbanded product design studio through which I've absorbed maybe some things about design but almost everything I know about well-told stories. The kind of stories people want to be a part of. As part of my own practice in surrounding myself with the kinds of thinking I want to imitate, each Composure scarf is made and worn to reflect on the stories of people in my life with virtues worth emulating. Consider being yourself an inspiringly imitable source of creativity for others, in passing on these notes with a quick forward (THX!) or by way of the subscribe page here. And as always, scarves and stories at alwayscomposure.com.